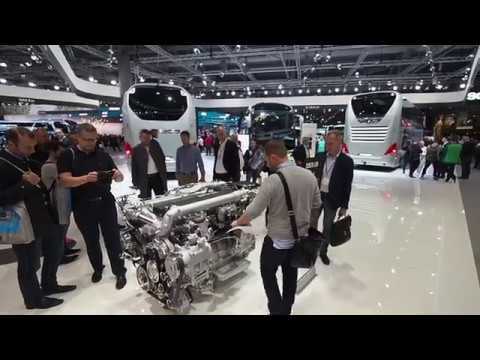 The MAN Truck & Bus exhibition stand at the IAA Commercial Vehicles 2018 International Motor Show in Hanover was in a class of its own; the 10-person AMBROSIUS project team, which directed up to 100 fitters during peak times, had turned a whopping 8,000 square meters into a brand identity. MAN presented 22 commercial vehicles, including trucks, buses and vans in several areas in addition to an outright world premiere in the field of electromobility. A highly relevant presentation area was created for each grouping of vehicles through the use of exhibition furnishings, ceiling banners and graphics on the floor and walls; for example, the truck area offered a trucker bar, and the bus area included bus stops. Particularly noteworthy is the eMobility exhibition tree, which was situated amid vehicles with alternative propulsion systems. Due to its far-reaching branches, the tree presented a particular static challenge, which was solved with a Plexiglas clad steel substructure. At the center of the exhibition stand was the Service Center that provided an interface between the vehicle areas. The AMBROSIUS team also constructed individual display items and furnishings for the Service Center. One part of the exhibition stand was designed as a two-story structure and provided space for offices and meeting rooms on the upper floor as well as a large cafeteria with nearly 500 seats. Before the 23 vehicles could be positioned at the MAN exhibition stand, the AMBROSIUS team installed more than 80 truckloads of material within a six-week period. The concept for the exhibition stand was created by Schmidhuber Brand Experience from Munich.